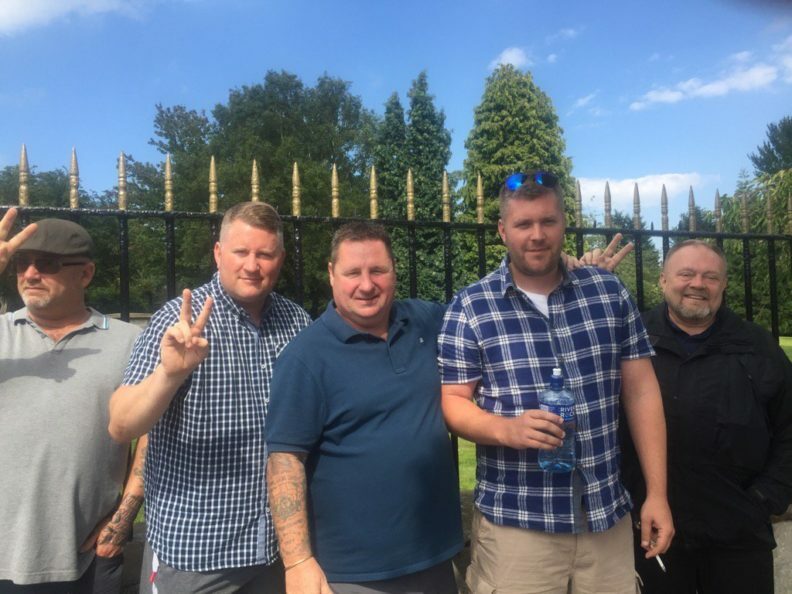 Pictured below, alongside Paul Golding (second from left), leader of the fascist group Britain First, is Jason Marriner (blue shirt), an ex Combat 18 fascist thug and convicted football hooligan. This is the sort of person that Britain First keep company with. One reason, among many, to demonstrate against Britain First next Saturday. We, the undersigned, support the protest – organised by Unite Against Fascism, trades unionists and others – in opposition to the intrusion by the fascist group Britain First in Rochdale on 22 July. The event page for the protest is here. The man arrested for the racist attack on Finsbury Park Mosque – which killed one man and injured eleven other people – is reported to have followed Britain First’s Golding and Jansen on Twitter. After the attack, Britain First posted that ‘Finsbury Park Mosque was notorious as a haven for Islamist terrorists and extremists’. Thomas Mair shouted ‘Britain First’ before he brutally murdered Jo Cox MP in 2016. The Britain First leader was also recently filmed trying to intimidate people outside East London Mosque, while members of the Mosque were working to give aid to people affected by the horrific fire at Grenfell Tower. An antisemitic priest who was due to speak at Britain First’s recent Birmingham rally was detained at the airport. This shows that these fascists are hostile not only to Muslims, but also to Jews and others. Former EDL leader ‘Tommy Robinson’ – pictured with the leaders of Britain First – has also been trying to stir up Islamophobia. Now Britain First are trying to create division by racialising the issue of crimes of sexual exploitation. Our thoughts are with all those affected by this. Sexual exploitation is an appalling crime but it is not linked to ethnicity or religion. We call on people to join us in opposing the attempt by the fascists of Britain First to hijack this issue in order to further their political agenda and to demonise and punish an entire community. We oppose Islamophobia, antisemitism and all forms of racism. We urge everyone to attend the demonstration in opposition to Britain First in Rochdale on 22 July.